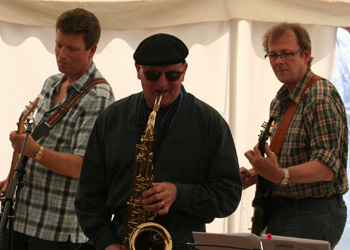 Many of our Blowout Sax students go on to play or have even set up their own bands.. The saxophone - what a beautiful Instrument! Pick it up, look at it, twiddle with the keys, then stand back and give up maximum respect to anyone who can play the thing. As for me playing the sax, that was a hidden ambition. But huh, no way - too complicated, best to just keep listening to, and admiring the great and not so great sax players out there. That was my thinking, until I met Mr Archer at the Blowout Sax School in Bath. A chance comment made to my daughter Sadie’s sax teacher ‘Berry Goddard’ changed everything. My ‘confession’ was brushed aside by Mr A, who suggested that we ought to see if we can get a note out of the thing first, whilst informing me that Elvis & half the Beatles couldn’t read music either!! We got that note out alright. In fact we got a tune out within the first lesson. It wasn’t pretty, but to me, it was ‘The first day of spring’, ‘England winning the World Cup’ and all that sort of stuff. The first lesson with Mark, confirmed Berry’s earlier comment, that I just, maybe able to crack this. Blowout sax has an anarchic & probably unique teaching method. The teachers know their stuff, and can get you playing. I practice as much as I can now, sometimes until my lower lip gives out. Then I go to the next lesson with Mark or Craig and we move on. I had a quiet, secret target after the first few lessons. To make up for lost time, the target was to play in a band within five years. I (We’ve) cracked it in four. This year I joined Bath based band ‘The Good Fridays’. We are an eight piece band – four guitarists, two female vocalists, a drummer and me. 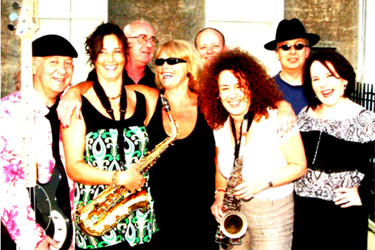 We play covers - predominantly rock, with a little bit of jazz & funk! I’m learning to play the ‘Clarence Clemons’ way right now. My one regret is that I didn’t meet up with the guys from Blowout Sax thirty years ago. It took a five minute chat with Berry & one lesson with Mark, to give me the confidence that I’d been looking for in all those years. But that doesn’t matter any more, I’m on the track now, with all the famous sax players and all the youngsters alike. It doesn’t matter what position I am, as long as I keep making progress. The track’s a big one with plenty of room. If your ambition is the same as mine, my advice is, jump on today, and get blowing. Favourite tunes are 'Farm Digging', a tune by Bristol local artist, Bunny Marrett and our take on Nat King Cole's Soul Serenade. Favourite moments include performances with Dennis Rollins and Abram Wilson and performing at St. Paul's Carnival alongside the general buzz and vibe that we have at rehearsals. As a complete rookie to the instrument, but with a similarly complete love for the way that it sounded (all the great pop sax solo’s from the ‘80s are in my CD collection somewhere), I picked up the Bristol yellow pages one Saturday morning (almost 9 years ago I think), and tried to find a teacher. At the time, Blowout Sax was the only obvious advert, and clearly streets ahead of the field when it came to marketing. I called, and listened to the zany message I now know so well, asking me to leave my details with the promise that someone would get back to me. Wondering what on earth I was letting myself in for, and just as I’d reluctantly resigned myself to having to ring every other teacher listed to find out what instrument they taught, Mark phoned back. Nervously I explained that I didn’t have a sax, didn’t know which one I wanted to play but loved the sound of the tenor, and added that I had played piano and recorder as a kid if that helped. He put me at ease straight away, explained that I didn’t need any musical knowledge, that there were 4 saxes, and that they usually started people on the alto as that was the easiest one to learn on. If I wanted I could try out and hire an instrument on a weekly basis, and if I liked it and wanted to buy one, I could put the rental money towards the cost. Not only that, but we were getting on so well that he decided there and then that he was going to teach me himself !! The rest as they say, is history (although if you want the real truth, ask Mark!). By the end of the first lesson he had enabled me to get the reed mastered (something I remember giving up on when I tried the clarinet at school). Within six weeks I’d bought my first instrument, three months later I started playing in a local Bristol band (the bassist had heard me practicing and asked me to stand in for their regular player), and a few months later a spot in the Blowout Sax Concert gave me a chance to play with and meet more Blowout Sax pupils and teachers; a great reason for learning to play in a school. Marks teaching technique, encouragement to learn to improvise at an early stage (something that classical training doesn’t do) and further opportunities to perform in public all gave me the confidence and enthusiasm to pursue my dream of learning to play and to replicate some of those ‘80s sax solos that I knew and loved so much. 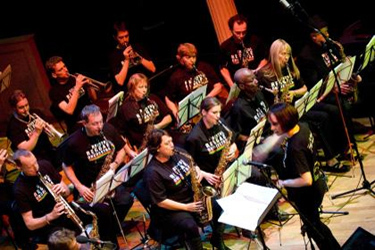 Compliments from audiences (and other musicians) followed and today I’m also playing as a regular musician and soloist with the Bath based Classic Soul Band; a contact that also came through my links with the school. Remarkably for me, I’m also still playing and having lessons. Why the latter? Well, even after all this time, I still love having them. I’ve been able to easily switch and mix teachers if I haven’t been able to make my regular lesson slot, and Berry is now helping me to find the self-discipline that I need, to learn and practice my scales so that I can work out tune and harmony parts in the band. I’m not even sure that I want to part with my alto any more, only to master playing different musical styles, and besides, I’ve also discovered that my arms are too short to play the tenor or the baritone! ...Which means there’s only the most difficult one left, and I know that if I want to do it, there’s a Blowout Sax teacher there to help me. I can’t rate the school and the team there highly enough. So if you want to give the sax a go, need a new focus in your life, or to increase your circle of friends, don’t think twice, pick up that phone and call them!